What are the most popular online bachelor's degrees offered in Massachusetts? As part of the New England Board of Higher Education (NEBHE), students in Massachusetts are eligible for the Tuition Break program. This offering allows students to enroll in out-of-state New England public schools at a discount, if the program they apply for is approved and not offered at a public school in the student's home state. This program applies to online and traditional programs alike. In a 2012 report, National Center for Education Statistics (NCES) estimated that approximately six percent of students enrolled in the state are in fully online programs; of that number, about 40% did not live in Massachusetts. The large number of out-of-state students is not surprising, considering the steps Massachusetts has taken to improve local online education opportunities. With the proliferation of such programs, the NEBHE now provides relevant information for distance learners on its website, including job search tools, an online textbook platform, updated state accreditation standards, and partner sites that provide additional academic and professional information. Those interested in pursuing an online degree from a Massachusetts school should begin their search at Massachusetts College Online (MCO). A consortium of 15 community colleges and nine state colleges, students may take online courses from the MCO's shared catalogue, among other perks. With these structures to support online education, as well as the free online courses offered from MIT and other schools through edX, distance learners in Massachusetts have a variety of postsecondary school options. A university with a global reputation, Cambridge-based Harvard University is one of the best online schools in Massachusetts. Harvard’s Extension School offers two online programs: a bachelor of liberal arts and a joint undergraduate/graduate management degree. Students in the liberal arts program are required to take three courses as non-degree seeking students. Once completed, they earn the right to apply to the program, and then complete a minimum of four courses on-campus. All applicants must have either two years of college credits or eight years of work experience. The management degree runs on a cohort model, with students visiting campus each summer for three-week sessions. In total, the program lasts four years and requires students to complete 24 courses, six of which are on-campus. Both programs charge enrollees the same base tuition rate, as Harvard is a private university. The University of Massachusetts-Lowell is one of the best online colleges in Massachusetts and offers a substantial body of accredited online courses and degree programs. Located in the culturally rich city of Lowell, Massachusetts, UMass Lowell strives to provide students with a high quality academic experience that is affordable and accessible to all. The public research institution promotes student success by providing opportunities for transformative learning rooted in innovation and collaboration. UMass Lowell offers a variety of fully online undergraduate and graduate degrees, as well as certificates, including information technology, criminal justice, and business administration. UMass Lowell recognizes that pursuing an online degree can be daunting, and the university provides academic support every step of the way. Prospective students can complete an online learning quiz to determine if distance education is the right fit for them, and a sample course is available through Blackboard to help familiarize students with the online learning platform. Boston University offers a slate of distance learning programs across law, the arts and sciences, education, and social work. Perhaps the most noteworthy offering is the undergraduate degree completion program. The program takes 30 months, as students complete between 64 and 76 credits depending on how many credits they previously earned (applicants must have between 52 and 64 earned credits and SAT scores are optional). The 16 course liberal arts curriculum features courses such as literature, film, and the American dream. BU’s online programs vary in terms of completion time and delivery method; some programs opt for asynchronous coursework, while others deliver coursework synchronously via a cohort models. Regardless of program, all online students in BU’s Metropolitan College -- the school’s distance learning and continuing education branch -- pay the same base tuition. Ideally located in the rural yet culturally vibrant community of Amherst, the University of Massachusetts-Amherst is a leader among Massachusetts online colleges. UMass Amherst is a top public research institution and has the largest state-supported library in New England with more than seven million items. With over 1,000 full-time instructional faculty, students at UMass Amherst are guaranteed to receive the individualized academic support that makes learning fun and meaningful. The university's online learning programs are designed to cater to the unique needs of distance learning students, and the flexible, convenient format makes educational attainment a reality for many busy professionals. Online courses are accessible 24/7 and are led by competent online educators who receive ample training in teaching online. Courses are powered by Blackboard, and students have access to a variety of degree programs, including hospitality and tourism management and a degree completion program that allows nontraditional students to build their own course of study. Bentley University -- located just west of Boston in Waltham -- offers just a single program entirely online: the bachelor’s degree completion program in business administration. Catering to part-time students who are also working professionals, coursework includes studies in statistics, global strategy, and organizational behavior. Each course lasts eight weeks and includes three online, synchronous class meetings with the professor. The program offers five start dates throughout the year to allow for maximum schedule flexibility. To gain admission, applicants must have completed between 48 and 60 college credits, usually general education requirements. Once accepted, all students pay the same base tuition regardless of their state of residence. Accepted distance learners also have access to Bentley’s online library, academic advising, and technology help desk, in addition to weekly, online office hours with their professors. Located in Westfield, Massachusetts, Westfield State University was founded in 1839 and was the first co-educational university in the U.S. to open its doors to people of all colors, genders, and economic backgrounds. Westfield State offers six online degree completion programs for students who have started their education and wish to earn their bachelor's degrees in fields that include business, history, and psychology. The academic programs emphasize community involvement and inclusion, and individuals over age 60 can attend the university for free. Tuition rates are competitively priced, and installment plans and financial aid are available to students. The school provides a high quality education to more than 6,000 students annually, and the student/teacher ratio is 17 to 1. As one of the best online colleges in Massachusetts, the school's top priority is student success. The school provides an online self-evaluation tutorial to determine if online learning is for them. Students need to be self-motivated and possess excellent writing skills. The University of Massachusetts-Dartmouth serves more than 8,500 students annually with students from 43 states and 46 countries. UMass Dartmouth is a leader among Massachusetts online colleges, and over 530 students were enrolled in its online programs for the 2016-2017 academic year. The online degree programs offered by UMass Dartmouth reflect the university's mission to provide students with a transformative academic experience that promotes lifelong scholarship and student success. The university offers a fully online BS in general business administration, as well as an MBA online and several certificate programs. The online courses are taught by top-notch faculty with training in online instruction. Prospective students interested in pursuing a BS in business administration must complete 120 credit hours and can transfer as many as 75 credits from an accredited institution. Lesley University was founded in 1909 by Edith Lesley, a radical woman who believed in the transformative power of education. Her philosophy continues to guide Lesley University today, and its many exceptional academic programs provide students with the knowledge and tools necessary to engage in a global society as compassionate, ethical leaders. Located in Cambridge, Massachusetts, Lesley University serves its local community and the world at large by instigating innovative research projects in a variety of areas including sustainability and clinical art therapy. Among its many prestigious academic programs are several online degree and certificate programs designed to meet the needs of adult learners and professionals. The university offers six bachelor's and nine master's degrees fully online. Students also have the opportunity for career advancement by completing one of the school's 10 graduate certificates. Online students can apply up to 90 transfer hours to their degree, and previous training and work experience can count toward degree completion. Conveniently located in the vibrant metropolis of Boston, Northeastern University is a premier higher education institution, and its Global Network is designed to expand the university's research-oriented, innovative approaches to education. A leader among online colleges in Massachusetts, NU Global Network employs more than 3,000 individuals across 150 countries. The diverse faculty and staff have the common goal of providing students with a high quality educational experience, preparing them for career success in a rapidly evolving technologically-driven society. The exceptional online programs offered by NU Global Network are part of the College of Professional Studies and emphasize an experiential learning model that promotes real-world experience. The programs are designed for the busy adult learner in need of flexible course delivery. Some of the school's fully online programs include health management, leadership, political science, and psychology. The online programs are powered by Blackboard, and students have access to several resources designed to enhance online learning experiences. Founded in 1894, Fitchburg State University began as a teacher training school for women with an initial student body of 46. Today Fitchburg has grown into a fully-accredited higher education institution with more than 6,500 students enrolled annually. A leader among online colleges in Massachusetts, this university offers several online degrees and certificates powered by Blackboard. Undergraduate programs available fully online from Fitchburg State University include RN to BSN and business administration with a management concentration. Several special education master's degree programs are available with concentrations in dyslexia, reading, and guided studies. Students have access to course content and online support 24/7, and a variety of academic resources are available to online students including library services, a demo online course, and technology guides. Tuition rates are competitive, and six credit hours is less than $2,000 per semester for both in-state and out-of-state students. Boston’s Berklee College of Music is one of the nation’s preeminent music schools, and one of the best online colleges in Massachusetts for online music degrees. Berklee offers online bachelor’s degrees in music production, music business, songwriting, guitar, and other music-related fields. Each program delivers coursework asynchronously and features full-time and part-time options. Students enrolled in an online program also pay 64% less base tuition than on-campus programs. Berklee evaluates applications holistically. Although the school does not have minimum GPA or standardized test thresholds, admissions counselors evaluate students based on their class rank. Transfer applicants may bring up to 60 approved credits with them from a regionally accredited institution. Berklee accepts applications for its online programs on a rolling basis; admission decisions are usually made within two weeks. Styling itself as the “American women’s college,” Bay Path University offers undergraduate programs to women and graduate programs to all genders. Provided they meet these gender qualifications, students at Bay Path can select from more than 20 programs online without ever having to visit campus in Longmeadow. Each program is accelerated, with classes lasting six weeks each. Bay Path’s online programs also offer six start dates throughout the academic year, and students can earn their bachelor’s degree in 18 to 36 months, depending on how many credits they transfer. Bay Path is one of the most transfer-friendly online schools in Massachusetts -- transfer students are permitted to apply up to 90 credits toward their degree. As a private university, Bay Path charges each student the same tuition regardless of location. To earn admission, online applicants must have a high school diploma or GED and must either have 12 college credits or submit an essay. Framingham State University is a public university that offers inclusive and affordable academic programs that emphasize diversity and student success. The university offers a variety of online courses in 18 subject areas and is one of the leading online colleges in Massachusetts. Students enrolled in one of FSU's online programs engage in course curricula designed to promote collaborative learning experiences that are challenging and meaningful. The University offers a BA with a major in liberal studies fully online and a competitive MEd program with concentrations in educational technology and school nutrition. Tuition rates for online programs are priced per course, and an online undergraduate course is $1,125 per semester and most online graduate courses are $1,255. Individuals over age 60 can enroll in undergraduate courses by just paying fees, and military veterans may qualify for state tuition exemption. Online learning is powered by Blackboard, and students have access to the Blackboard On-Demand Learning Center. The University of Massachusetts-Boston is a premier urban institution of higher education. The university provides an intimate learning environment with a 16:1 student-to-faculty ratio. Online learning plays a key role in UMass Boston's global outreach, and the university is one of the best online colleges in Massachusetts. This schools offers a variety of online degrees from the College of Advancing and Professional Studies, including a BA in global affairs and a RN-to-BS program. Online courses are delivered through Blackboard and offer the flexibility that many adults need to achieve their professional goals. Most of the courses offered online are delivered asynchronously, allowing students to complete assignments at their convenience. Some coursework is synchronous, and students are required to attend live lectures via the university's video-conferencing program. Successful UMass Boston online students are self-motivated and have excellent time management skills. Endicott College is a small, private school with big ideas and global connections. Located just outside Boston in Beverly, Massachusetts, Endicott was founded in 1939 and was originally an all-women's university. Today, it is coeducational and offers a range of high quality programs fully online that incorporate the university's mission to provide a meaningful and personally enriching academic experience that challenges students to grow professionally. Online learning at Endicott is flexible and convenient. Students choose when and where they complete their assignments, and accessibility is an important part of the Endicott College online experience. All of the university's professional studies undergraduate programs are available 100% online with degrees including business, psychology, and liberal studies. Online students do have the option to take some of their classes in person; all of online undergraduate degrees can be taken in a blended format. Salem State University provides students with an exceptional academic experience that emphasizes global responsibility and creative problem solving. One of the top online colleges in Massachusetts, Salem State offers three fully online academic programs that embody the university's vision to provide students with an inspirational education that promotes personal and professional achievement. The competitive online programs are part of the School of Continuing and Professional Studies. The fully online BS programs in fire science administration and intercultural communications utilize cutting-edge technology to enhance the online learning environment, and the programs cater to upper-level transfer students. Students must possess an associate degree to enroll in the intercultural communications program. The university provides a number of resources for online students, including an online learning overview and links to improve keyboarding skills. Assumption College offers a liberal arts education founded on the principles of Catholic tradition. Open to all denominations, the school's academic programs emphasize diversity and the balance between scholarship and spirituality. One of the best online colleges in Massachusetts, Assumption College offers several fully online programs designed to help busy professionals achieve their academic and career goals. The university offers online degrees in business, humanities, human services and rehabilitation studies, and social sciences. The innovative online bachelor's degree program in human services and rehabilitation studies is modeled after the university's exceptional rehabilitation master's program and prepares students for a variety of exciting career opportunities in the mental health industry. Assumption College participates in a transfer agreement with local community colleges allowing transfer students to easily apply earned course credits toward the online degree program of their choice. Elms College is a Catholic university located in Chicopee, along the Connecticut River in western Massachusetts. The coeducational institution integrates liberal arts with professional studies to create high quality, versatile degree programs that emphasize the development of foundational knowledge and practical skills. Elms College strives to instill in its students a sense of societal responsibility rooted in faith and compassion. One of the top online Massachusetts colleges, Elms College offers several fully online programs including an associate degree in speech language pathology and five bachelor's degree completion programs, which are designed for students holding an associate degree in a relevant field. The online programs are powered by Moodle, a user-friendly course delivery platform. The majority of online curriculum is asynchronous, and students can complete the coursework at their convenience. Online students are required to participate in synchronous discussion forums weekly over video conferencing. Based in Boston, Wentworth is focused on career-centered education across engineering, technology, and design. The school’s slate of online programs is constantly growing, and WIT now offers six online programs: master’s degrees in applied computer science, construction management, technology management, and facility management; and a bachelor’s degree and a certificate in project management. Delivery methods of these programs vary -- some offer coursework asynchronously and eliminate in-person requirements, while others use a blended learning format. In general, online programs at WIT forgo minimum GPA and standardized test requirements in favor of work experience and prerequisite coursework. As a private university, WIT charges each online student the same base tuition. WIT distinguishes itself from other online schools in Massachusetts by focusing on experiential learning. Describing itself as a “maker community,” the school offers co-op experiences, community partnerships, and startup/entrepreneurial opportunities to its students. Located in Springfield, AIC was the first college in New England to admit women. The school currently offers four online programs: the RN to BSN, MSN, and doctorate in occupational therapy programs are completed entirely online and without any on-campus requirements, while the MBA program uses a hybrid model. Coursework in each program is delivered asynchronously. AIC charges each online student the same tuition. Additionally, 99% of AIC’s full-time undergraduates receive grants or financial aid from the school or the government. Undergraduate transfer students may bring a maximum of 90 credits with them to AIC. The school does not list minimum GPA or standardized test requirements to gain admission, as decisions rest on academic and life experience instead. Fisher College was founded in 1903 and is a private, nonprofit university that specializes in enriching the lives of its students through its life-changing academic programs. The university provides an affordable high quality education and has a special interest in the education of military members. Fisher College's motto is ubique fidelis, or "everywhere faithful," and its influence is evident in the college's dedication to student success. A leader among online colleges in Massachusetts, Fisher College offers a variety of fully online academic programs through its Accelerated and Professional Studies; bachelor's options include psychology, event management and hospitality, and criminal justice. Online courses are delivered through Blackboard and are completed in eight-week intervals. Tuition is competitively priced, and a three-credit online course costs $1,077. Fisher College's online degree programs are student-centered and require students to be active contributors in the online learning environment by participating in discussions and course forums. A Roman Catholic liberal arts school based in Boston, Emmanuel College counts John F. Kennedy among its former board members. The school offers two hybrid programs -- an MS in management and a graduate certificate in management and leadership -- in addition to three online programs: an MS in management, a graduate certificate in research administration, and an instructional design certificate. Students enrolled in the three online programs can earn their degree without ever visiting campus. These online programs also deliver coursework asynchronously. All applicants to these online graduate programs must have earned an undergraduate GPA of at least 2.5. As Emmanuel is a private college, each online student pays the same base tuition. A Roman Catholic school founded in suburban Boston at the turn of the 19th century, Labouré College was originally a training school for nurses. Today, Labouré continues this focus on nursing and health sciences by offering four online programs: certificates in medical coding, clinical documentation improvement, intraoperative neuromonitoring, and neurodiagnostic technology, in addition to an RN to BSN program. While the certificate programs deliver coursework asynchronously and do not include on-campus requirements, the RN to BSN degree is a hybrid program that requires some on-campus coursework. Labouré is a private college and all online students pay the same base tuition. The school currently accepts students for the fall, spring, and summer semesters. General admissions requirements ask students to submit diplomas (or a GED) and transcripts. However, students applying for the neurodiagnostic technology and intraoperative neuromonitoring certificates must meet additional requirements that include a minimum GPA, work experience, and an associate degree. The school evaluates transfer credits individually, and students in the RN to BSN program must complete at least 31 credits at Labouré. AMC is a small Catholic school located in Paxton. Founded in 1946 by the Sisters of Saint Anne, the school provides educational programs that integrate liberal arts and professional development. AMC focuses on three areas: service to others, innovation, and education for all. All classes are small to foster cooperation between students and mentorship from faculty. The school currently offers three online undergraduate degrees: an RN to BSN, a BS in fire science, and an BS in emergency medical services administration. The fire science program has received recognition from the Fire and Emergency Services Higher Education network. Graduate students may pursue the school’s online master of public administration. This degree features five concentrations, including criminal justice, homeland security, and emergency management. Applicants to the fire science program or nursing program must have 60 credits or an associate degree. Undergraduate students may apply for dual enrollment in master’s level courses. Our affordability methodology considers value-driven metrics and ranks schools that have low tuition rates, as well as proven graduation rates and employment outcomes that provide a high ROI for students. For students in Massachusetts, there are plenty of opportunities to find an affordable program locally. While distance education provides more flexibility than an exclusively residential curriculum, there are still plenty of advantages to attending a local online college, including access to lower tuition prices and local scholarships. If you're considering going back to school, and are thinking about studying online, the following list of cheap accredited online colleges in Massachusetts will help you start your search. Established in 1898 in Boston, Northeastern University offers a number of online degree completion programs, graduate degrees, and certificates through its Global Network. The school continues to expand beyond its campuses in the United States and Canada into distance learning programs that emphasize experiential learning. Innovative undergraduate programs cover subjects such as biotechnology, environmental science, and computer engineering. Students complete coursework through the Blackboard learning platform in classes that are taught in both synchronous and asynchronous formats. The school's learning resources include free access to online tutoring. NEU offers tuition discounts for veterans and active duty service members. Established in 1863, UMass Amherst has expanded beyond its historic flagship campus to offer a number of distance learning programs tailored for working professionals and other nontraditional students. The school is the largest public university in New England and is one of the most affordable online colleges in Massachusetts. UMass Amherst offers fully online and hybridized degrees in fields such as nursing, journalism, and anthropology. The school delivers courses through the online platforms Moodle, Blackboard, and Spire using both synchronous and asynchronous formats. The school offers new students a self-paced orientation course on Blackboard. Students can transfer up to 75 credits from other institutions. UMass Boston, established in 1964, has built a reputation as one of the most affordable online colleges in Massachusetts. The school offers a wide range of online degrees, certificates, and professional development programs in innovative fields such as instructional design, mental health counseling, and vision rehabilitation therapy. Students take most courses in a synchronous format through Wimba Classroom, though some coursework is taught asynchronously through Blackboard and Atomic Learning. Students residing in Alabama, Arkansas, Maryland, or Minnesota are ineligible for UMass Boston's online courses and degrees. UMass Lowell, established in 1894, has expanded its innovative curricula into distance learning programs, placing it at the forefront of affordable online colleges in Massachusetts. The school offers a wide range of fully online and hybridized degrees in fields such as nursing, engineering management, and psychology. UMass Lowell's undergraduate programs are geared toward first-time learners and working professionals seeking to complete their degrees. Classes are taught using the Blackboard learning platform in both synchronous and asynchronous formats. On top of its online degree options, UMass Lowell offers a number of certificates and non-credit training programs. Established in 1904, Assumption College provides over two thousand undergraduates with a well-rounded liberal arts education rooted in the Catholic tradition. AC offers a number of fully online and hybridized degrees and certificates tailored for busy professionals and students looking to expedite their education. Undergraduate students can pursue concentrations in areas such as business and the humanities, and nontraditional students can earn certificates in practical fields like counseling and medical billing. Students complete coursework through Blackboard in classes that are taught in both synchronous and asynchronous formats. AC gives all students access to free online tutoring through the eTutoring platform. Since its establishment in 1838, Westfield State University has earned a reputation for its inclusive, student-focused ethos. Along with its fully online and hybridized degrees, this ethos makes WSU stand out among affordable online colleges in Massachusetts. Online degree completion programs are available in disciplines such as business, criminal justice, and liberal studies, and students can also minor in subjects such as art, management, or psychology. Courses are taught in both synchronous and asynchronous formats using the Plato Courseware and Blackboard Learn platforms. Students can enroll in online courses either part- or full-time. WSU offers free tuition for all students over 60 years of age. Fitchburg State University, established in 1894, offers an array of degrees and certificates in over 25 fields, with fully online degrees available in areas such as nursing and business administration. The school also offers a number of graduate degrees and certificates in areas such as accounting, forensic nursing, and educational leadership. Coursework is completed through Blackboard in classes that are taught in a primarily asynchronous format, with some synchronous components. FSU offers all students free access to online tutoring through the eTutoring platform. The school allows transfer students to apply up to 60 credits from a two-year institution, or 75 credits from a four-year institution. Founded in 1895, UMass Dartmouth maintains a strong reputation among affordable Massachusetts universities through its highly regarded faculty and its suite of fully online and hybridized degrees. Fields covered in online undergraduate programs include marketing, business administration, and accounting. Courses are delivered through Blackboard in both synchronous and asynchronous formats. Free online tutoring is available through the eTutoring platform. Distance learners in Alabama, Arkansas, Kansas, Maryland, and Minnesota are ineligible to take UMass Dartmouth's online courses. Founded in 1839, Framingham State University is one of the most affordable colleges in Massachusetts and offers a wide range of fully online and hybridized degrees geared toward distance learners on a budget. The school's large catalog of undergraduate programs covers subjects such as art history, computer science, and early childhood education. Master's degrees and certificates are also available in areas like educational technology, healthcare administration, and nursing education. Classes are taught in both synchronous and asynchronous formats, and students complete coursework through Blackboard. FSU offers all students access to its free online tutoring service through the eTutoring platform. Established in 1928, College of Our Lady of the Elms maintains a distinct identity among private colleges in Massachusetts through its pragmatic and community-focused ethos. Elms offers online programs geared toward working professionals looking to complete their degrees. Students can earn undergraduate degrees or certificates in the fields of speech language pathology and healthcare management. The school typically offers courses in an accelerated format, following a collaborative model which requires students to periodically check in with a group of peers. Degrees take a little over a year to complete. Students take courses through the online platform Moodle using both synchronous and asynchronous learning strategies. Endicott College, established in 1939, favors a flexible, student-focused approach. Through its Van Loan school, Endicott offers an array of fully online and hybridized degrees and certificates in areas such as autism and applied behavior, nursing, and health informatics. A number of graduate degrees are also available in areas such as teaching, business administration, and homeland security studies. Students take courses through the Canvas learning platform in classes that are taught in both synchronous and asynchronous formats. The average enrollee to Endicott College has earned a high school GPA of 3.3. Established in 1854, Salem State University represents one of the most affordable online colleges in Massachusetts. The school offers bachelor's degrees in fire science administration and intercultural communication. An RN to BSN program is also available fully online. Students take courses asynchronously using the Canvas learning platform. Additionally, SSU offers a number of online and hybridized programs in continuing and professional studies, and provides generous access to scholarships for veterans, active service members, and their dependents. Established in 1815, Nichols College's relatively small enrollment guarantees a personalized student experience. The school offers several online and hybridized degrees. The bachelor's degree in business administration is offered fully online, while hybrid degrees are available in disciplines such as accounting, criminal justice, and hospitality management. Courses come in both self-paced and accelerated formats, and faculty work closely with students to customize the curriculum. The school allows non-degree students to take up to five courses. Additionally, NC boasts its own job and internship board. Student can transfer up to 90 credits from other institutions, making this a highly affordable option for learners seeking to complete their degrees. Established in 1909 in beautiful Cambridge, Lesley College provides intimate, student-focused instruction through a wide range of fully online and hybridized programs. Undergraduate degrees are offered in art and design, business management, human services, liberal arts, and psychology. Master's degrees are also available in business and education. The school does not require students to enroll in a program in order to take online courses, allowing individuals to explore subjects for their own personal and professional development. Online courses include topics such as design for user experience, special education, and digital technology. Established in 1905, a relatively small enrollment size and pragmatic approach distinguish Fischer College among affordable colleges in Massachusetts. The school offers a plethora of degrees and certificates at the undergraduate and graduate levels in fully online and hybrid formats. Fields covered in online coursework include criminal justice, management, and medical coding. Courses are taught in an accelerated format over six eight-week terms using both synchronous and asynchronous formats, and students complete coursework through Blackboard. FC offers opportunities for part-time internships that usually can count for credit, and students can take advantage of non-credit online courses for professional development through the school's partnership with Education2Go. Online education in Massachusetts offers amazing potential. With so many exceptional options, students should consider several key factors. These can influence school choice, affordability, and career impact. Accreditation - A degree from a school with no accreditation will be worth little in the professional world. Financial aid may also be dependent on attending a school with the proper accreditations. Degree congruency - Many schools confer the exact same degree through on-campus and online programs. Other programs differ somewhat for the online format. If you desire a degree congruent to the on-campus offering, ensure this is how the program is established. Job Placement/Career Advancement - You don't simply want a degree, but one that launches your career. Investigate a school's advisory and career placement programs, and partnerships with businesses in your desired industry. 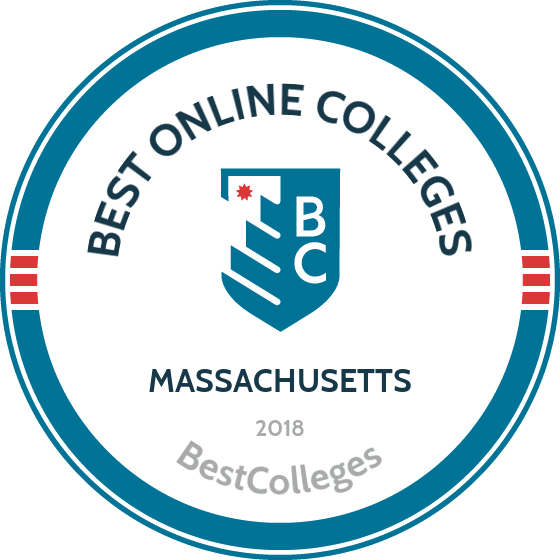 Browse our list of the best online colleges in Massachusetts for more insight into distance learning programs in this state. 22.3% of undergraduate students in private for-profit schools studied entirely online. 5.2% of undergraduates in public four-year institutions studied entirely online. 73.8% of undergraduates studying entirely online lived in the state. 0.9% of undergraduates studying entirely online lived outside the U.S.
Employment growth in this profession is moderate in Massachusetts. According to the Massachusetts Labor and Workforce Development, long term projections show an increase of 5% in the total number of jobs between 2014 and 2024. Wages increased by 7% from 2011-2016. In 2016, what were the top careers in Massachusetts for people who had a degree in business administration and management? Data source: Massachusetts Labor and Workforce Development, Bureau of Labor Statistics. Data may not be available for every year. According to the Massachusetts Labor and Workforce Development, long term projections show an increase of 5% in the total number of jobs between 2014 and 2024. Wages decreased by 38% from 2011-2016. In 2016, what were the top careers in Massachusetts for people who had a degree in liberal arts and sciences/liberal studies? Employment growth in this profession is strong in Massachusetts. According to the Massachusetts Labor and Workforce Development, long term projections show an increase of 175% in the total number of jobs between 2014 and 2024. Wages increased by 15% from 2011-2016. In 2016, what were the top careers in Massachusetts for people who had a degree in psychology? Employment growth in this profession is moderate in Massachusetts. According to the Massachusetts Labor and Workforce Development, long term projections show an increase of 9% in the total number of jobs between 2014 and 2024. Wages increased by 6% from 2011-2016. In 2016, what were the top careers in Massachusetts for people who had a degree in registered nursing? Employment growth in this profession is poor in Massachusetts. According to the Massachusetts Labor and Workforce Development, long term projections show a decrease of 1% in the total number of jobs between 2014 and 2024. Wages increased by 14% from 2011-2016. In 2016, what were the top careers in Massachusetts for people who had a degree in criminal justice/safety studies?